Why Is It Important to Change Air Filters Regularly? If you’re a homeowner, you’ve probably heard all about the importance of changing the filters in your HVAC system. So, what exactly does a filter do? How do you pick the right one? And why is it so important to change filters regularly? To answer those important questions, we’ve put together our own version of Air Filters 101. Getting right down to the nitty-gritty, it stops the nitty-gritty from entering your house. No one wants to breathe air that contains allergens, dust and dirt -- that can lead to health issues – so we use filters to help improve the air quality in our homes. And that dirt and dust from the outside air would flow through our HVAC systems without filters, so it keeps our furnaces clean and functioning properly as well. How do I know what filter is right for my HVAC system? Walking down the aisle of your hardware store to choose a filter can be daunting to some because there are so many different types and brands of filters – disposable, reusable, thick ones, thin ones, and everything in between! The first place to check is the furnace’s manufacturers manual because it may require a specific type. Next, you want to look at the filter’s MERV Rating (Minimum Efficiency Reporting Value). This is how effectiveness is measured for air filters. Basically, a higher MERV rating means that it provides better filtration – something that usually also comes at a higher cost. If you really want better air quality, says Keith, buy a better filter, but also increase the size to allow better airflow. “Thicker is better. A 4” or 5” thick filter is the best. It will require some duct modifications, but in the long run you’ll be happier. Thicker filters require less frequent replacement and allow for better airflow, even in a high efficiency model,” he says. Why is it important to change? How often should I change it? Not only is a filter important to change in order to improve air quality, but according to ENERGY STAR, it’s super important when it comes to energy efficiency too. “A dirty filter will slow down air flow and make the system work harder to keep you warm or cool — wasting energy,” according to the ENERGY STAR website. That means a filter that is clogged with dirt and dust will need to work harder to provide heating and cooling to you home and can lead to damage to your HVAC system or even a complete system failure. As a basic rule of thumb, change the standard 1"-3" air filters every 1-2 months, and a 4" air filter at least twice a year – that includes the warm months. 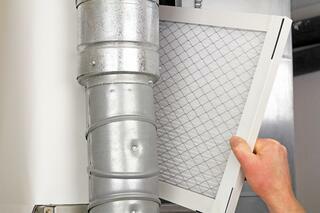 A clean filter will save you money in the long run and keep you home healthy all year long!